Brief Synopsis – A young bird needs to find some food, but realizes quite quickly that the task isn’t as easy as one might assume. My Take on it – PIXAR has always been the animation studio that has furthered the impact of animation over nearly 30 years. This film is no exception to that rule. The animation employed for this short film is amazing to watch because things are shown with such detail that it really borders on looking like live action. I especially loved the way that the grains of sand and water were shown. Animation has always been furthered by watching animals in the wild and finding ways to imitate their movements, and this film does that wonderfully for us to be able to view a common occurrence in nature up close and personal. They are able to really push the envelope here and show us how realistic looking animation can actually be. The story itself is heartwarming because it shows the perseverance and fortitude of a young bird who must learn to overcome a fear in order to find food and survive. 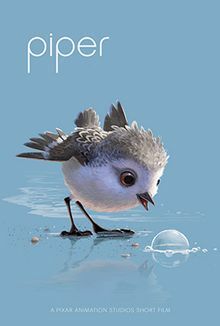 I hope that PIXAR keeps continuing to make impactful film (even short ones) like this for us to be able to enjoy and be immersed in the wonders of how far animation technology has come. Tnx to Jay of Life vs. Film for convincing me to watch this film! Bottom Line – Another great film by PIXAR. The animation is amazing to look at here and the water and rocks all seems so real it’s unbelievable. It appears that once again, watching the habits of animals really gives the animators ways to try and push the envelope with their ideas and for furthering the realism of animation. Highly Recommended! Glad you liked it! I love the cut from the bird’s first altercation with a wave to being shell-shocked and twitching back in the nest.